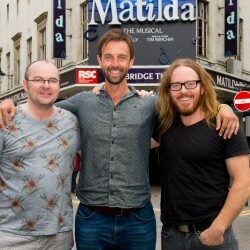 The Royal Shakespeare Company’s production of Roald Dahl’s Matilda The Musical continues to play to packed houses at the Cambridge Theatre in London. Matilda has now been seen by almost 1.5million people since it transferred to the West End in October 2011. The production was commissioned by the RSC and played to sold-out audiences at the RSC’s The Courtyard Theatre in Stratford-upon-Avon for twelve weeks from November 2010 to January 2011. Tickets are now on sale until Sunday 24 May 2015. Craige Els will join the company as Miss Trunchbull from September, playing alongside James Clyde (Mr Wormwood), Haley Flaherty (Miss Honey) and Kay Murphy (Mrs Wormwood). Craige has previously appeared on stage in Timon of Athens, Antigone and The Cherry Orchard (National Theatre) and on screen in Ripper Street, The Bletchley Circle and Call The Midwife. Further theatre credits include Mamma Mia! (Novello), Oklahoma! (Chichester Festival Theatre), The New Yorkers (Sadler’s Wells), Never Forget (West End and Tour) and Spamalot (West End). Matilda Shapland and Violet Tucker will join Tasha Chapple and Lottie Sicilia in the title role from September 2014. Adult cast includes: Lucy Jane Adcock, Fabian Aloise, Ashley Cooper, Jonathan Cordin, Ashleigh Drew, Nicholas Duncan, Demi Goodman, William Kenning, Antony Lawrence, Max Parker, Lisa Davina Phillip, Charlotte Scott, Tommy Sherlock, Hollie Taylor, Amy Thornton, Jason Winter and Joshua Wyatt. Lara Denning will play the role of Miss Honey from 29September – 26 October. Nael Ameen, Robyn Ashwood, Lily Blackwell, Joshua Cameron, Kira Caple, Polly Grace Coombes, Connor Davies, Denzel Eboji, India Jane Erlam, Georgia Farrow, Rory Fraser, Havana Garcia, Emile Gooding, Remi Gooding, Ilan Galkoff, Luka Green, Hannah Hutchins, Lauren Marler, Ruby McNamara, Miriam Nyarko, Annabel Otterburn, William Price, Rory Toms, Harry Tunningley and Arthur Yamaguchi. Matilda The Musical has now received a total of 50 awards in Stratford-upon-Avon, London and New York. Sweepingthe board at the 2012 Laurence Olivier Awards, winning a record-breaking seven awards, Matilda The Musical has gone on to take Broadway by storm winning four Tony Awards® and a Tony Honor for Excellence in the Theater for each of the four girls sharing the title role.